This lighter was bought at the Truck Stop (many of them were) for about $5.00. 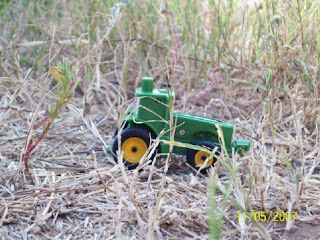 I thought it was funny taking its picture in the grass, since it is a tractor,lol. make it feel at home. The design is flawed, I do not like where you light it at. Maybe it is a matter of getting used to it. Of course I hardly use any of the lighters in my collection ( after the day I buy them). If this one wasn't bought for me, I do not think I would have gotten it on my own. But, now I would like to get a cow one and other 'Farm' themed ones.